I am always on the look out for things to interactively play with my grandchildren, They spend way too much time in front of the tv and video games. Thumb Things Fair Trade Finger Puppets were new to me. I love play acting so I thought we would try them out. My grandson came over to play with me this past weekend. I don’t get to see him much because I work and he has so much to do. I treasure my time with him. I pulled out my Thumb Things Fair Trade Finger Puppets to tell him stories with my hands. He was thrilled by them. 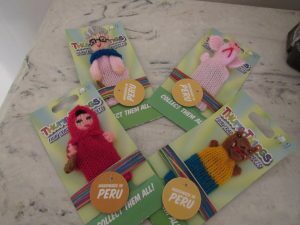 They are colorful and so much fun to play with.Thumb Things Fair Trade Finger Puppets are made in Peru. They have over 200 different puppets to choose from. You can never get bored and your kids sure won’t either. Each finger puppet is hand knitted and full of detail. We told the story of the three little pigs. We told the story of the big bad wolf and little red riding hood. 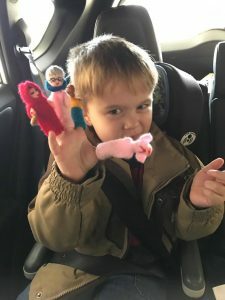 He was fascinated by the finger puppets. I loved being able to relive the stories I grew up with and shared with his Mom, his older sister and now my precious grandson. These puppets will be great for our travel time. Its so hard to keep little ones from growing bored and weary and these are perfect. I plan to purchase more because he loved them so much. I think apart from the delight in my grandson’s face, the thing I like most about Thumb Things is they give back. They are members of the 1% For the Planet which is a growing global movement who give 1% of their annual sales to environmental organizations to help protect our planet. I love that! I hope you will go to their website here and buy your kids or grandkids something fun and interactive for your play time together. Life is so short. Go play!